The people of Gjirokastër spend their days speculating on the rivalry between two doctors; Big Dr Gurameto with his German connections and Little Dr Gurameto with his Italian. When, in 1943, the Nazis roll up to the city gates, a group of citizens fire upon them. Whilst the city folk fear the implications of this rebellion, Big Dr Gurameto recognises an old college friend in the Colonel and invites him and his men to dinner. Soon rumours are flying. The Albanian city of Gjirokastër is a character in its own right in The Fall of the Stone City. The people are more representative of the city than individual personalities and this gives it the feeling of being a piece of folklore. The doctors come across as being the equivalent of celebrities but Big Dr Gurameto’s actions become entwined with the fate of the city. The style is full of charm and gives in the impression that the Nazi occupation was much more civilised and amenable than the Communist rule that came after. 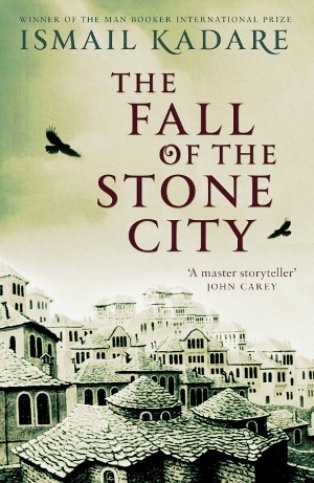 I always appreciate learning a little bit of history in a novel and I previously had no knowledge of Albania during the war. However as the story progresses, the lines blur between fact and fiction and something at the end makes me feel that is a reworked piece of Albanian mythology. And it’s the ending that really brings it together for me to make it a great little novella. I think you need to approach it as a piece of folklore rather than straight forward historical fiction. I haven’t read any other works by Ismail Kadare so I can’t compare but I will be looking out for his work in future. Originally written in Albanian, this edition has been translated into English by John Hodgson. 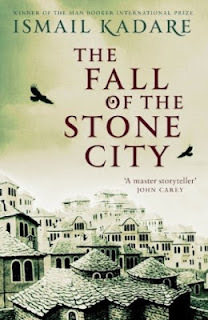 Published by Canongate, The Fall of the Stone City is currently available in hardback and ebook editions. Thanks go to the publisher for providing a copy for review. Perhaps, when you expect to read historical fiction (as the Nazi occupation must surely be), you wouldn't expect to find mythology instead. Something for the Canongate Myth series? ;-) Ismail Kadare is an author whose books I haven't read yet, will be adding some of them to my tbr now. It has thew perfect tone for the myths series...though it might not be a myth at all...it's wonderfully mytserious! I think this is quite normal for his writing having read a few articles; history and folklore of Albania intermixed.